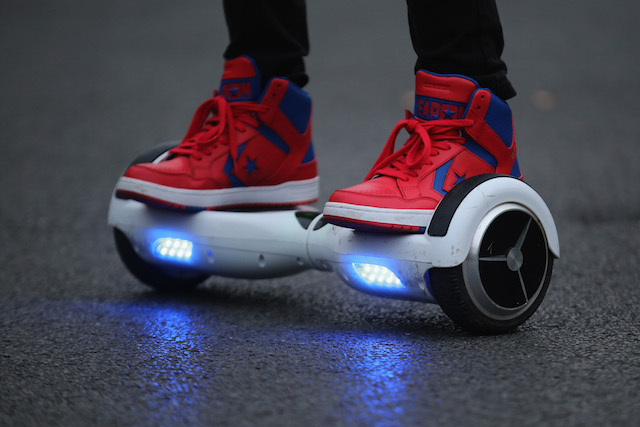 "Hoverboards" are literally the hot trend this year, and as these electrically motorized skateboards (which are more like self-balancing scooters and less like Marty McFly&apos;s flying hoverboards) are gaining popularity throughout the country, there are some new regulations that will take place in 2016 that you should know about if you&apos;re planning on riding them. In October, California Governor Jerry Brown signed into law legislation that reversed a nearly 40-year-old state ban on using electrically motorized boards on the streets. "The new law defines &apos;electronically motorized board&apos; as a wheeled device designed to be stood on and powered by electronic propulsion, going no more than 15 miles per hour," according to the California Highway Patrol. The law will take effect on Jan. 1, 2016, and will allow riders to use them in bicycle lanes, pathways and roadways. Last week, the California Department of Motor Vehicles released a reminder to Californians of the new 2016 law, and included details about electrically motorized skateboards. Laws on these boards are different from state to state, and in New York, they&apos;re apparently illegal to use on the streets. Riders must be 16 years or older to use the boards. Riders must wear a helmet when riding the boards on highways, bikeways or any other public bicycle paths, sidewalks or trails. Riders can only use the boards on streets where there are speed limits of 35 mph or less, unless they&apos;re in a bike lane. Riders can go no faster than 15 mph on highways, bikeways, public paths, sidewalks and trails. The boards must be equipped with safety equipment like reflectors and lights for nighttime operation on roads. Riders are prohibited from operating the board while under the influence of an alcoholic beverage or any drug, or combination of both. Convictions for violating this law is punishable by a fine of up to $250. Although California law makes electrically motorized skateboards soon street-legal, don&apos;t expect it to be the same on the UCLA campus. According to the Daily Bruin, "Hoverboards will still be prohibited in walkways and hallways at UCLA because an existing law grants the University of California Board of Regents the power to regulate transportation on University campuses."